Discovered in the late 1960s in Tanzania, and found exclusively in this tiny area of the world, tanzanite exhibits a rich violet-blue color for which the gemstone is treasured; often it is heat-treated to achieve this color. Colors range from blue to purple, and tanzanites that are medium dark in tone, vivid in saturation, and slightly violet blue command premium prices. 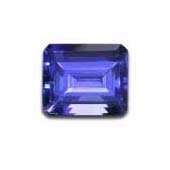 As tanzanite can be less expensive than sapphire, it often was purchased as an alternative. However, it has increased in popularity and now is valued more for its own beauty and brilliance than as a sapphire substitute.